Nashville’s biggest stars performing on stage! This CD is commercially available for the first time! 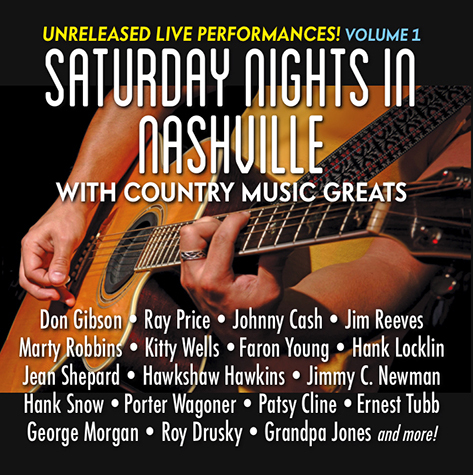 This exciting new CD presents, for the first time, UNRELEASED live performances by some of Nashville’s greatest country music artists, in a thrilling collection that has never been commercially available until now! The 35 tracks include stars like Don Gibson, Johnny Cash, Patsy Cline, Ray Price, Porter Wagoner, Marty Robbins, Jim Reeves, Hank Locklin, George Morgan, Faron Young, Jean Shepard, Jimmy C. Newman, Roy Drusky, Hawkshaw Hawkins, Kitty Wells, Grandpa Jones, Billy Grammer, Hank Snow, Cowboy Copas, Bobby Lord, Margie Bowes, Mac Wiseman, Ernest Tubb, Moon Mulican and the Old Hickory Singers. Also featured are the Anita Kerr Singers, Jordanaires, Chet Atkins, Floyd Cramer, Hank Garland and more! They do their big hits and in some cases songs you’ve never heard before! The sound quality is superb — so rich, detailed and alive! It’s like being there in a front-row seat, as the audience responds with enthusiastic applause, whistles and cheers! Also hear some of the artists talk between numbers. This thrilling (import) release showcases for the first time, long-lost live recordings that are truly historic, and lets you enjoy traditional country music’s legendary stars from the 1950s and ’60s at their best! It’s a keepsake CD you will love to listen to over and over again! Click the icon below to LISTEN TO SAMPLES of *some* of the tracks on this CD! Then scroll down to order!